Are you doing it wrong?! Most of us are you know. In the morning, when you're making that strong Sumatra pour-over, do you ever notice that the paper filter always seems just a bit big for the machine? 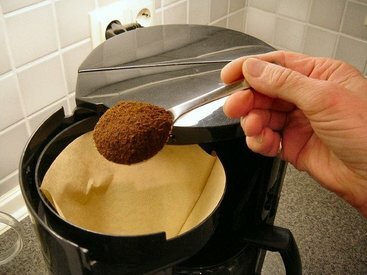 Well, I'm going to let you in on a little secret — there is actually a right way to use a coffee filter, and most of us have no idea what it is. I chalked up "Why doesn't my coffee filter ever fit correctly?" to being one of the great mysteries of life. I had no hope of figuring it out, until Rebecca Shapiro from the Huffington Post, so nicely pointed out that we are all being unobservant dum-dums. I had assumed, like most people, that I was simply buying the wrong-sized coffee filter for my machine. While I make coffee several times a day, I never meditated too deeply on why it was always poking over the edge, requiring me to crumple it down to make it "fit" in its plastic container. Indeed, I never thought to look at the packaging beyond a casual glance at the labelled filter size.